Haworthia attenuata-fasciata comes in many varieties. The plant has lots of horizontal stripes, making it easy to see why the common name is 'zebra stripes'. Haworthia attenuata markings vary from solid green to tiny white bumps, although the variety pictured here seems to be the most common. There seems to be a lot of confusion about the species name. In some genus of plants, like cactus, the only way to tell which of two species a particular plant is is to look at the flower or inflorescence. I have hundreds of Haworthia attenuate...or Haworthia fasciata...and the blooming structures look identical to me. I have not examined them under a microscope, studied the the individual parts, or anything remotely scientific, so I'm willing to have a Ph.D. tell me I just don't know what I'm talking about. I HAVE noticed that an individual clump that has broad, heavy horizontal stripes will sometimes throw off a pup with just bumps, or some will be smoother, knobbier, etc., and vicey-versey. So, until I hear otherwise, I call this: a still-evolving species with lots of variation. Haworthia attenuata is tolerant of a wide range of conditions, from full sun to (almost) full shade, lots of water to very little. There is a white variety also, which is not as tolerant of anything, judging from my own personal experience. 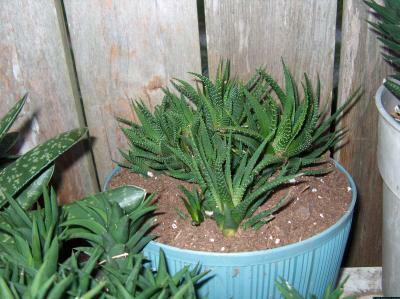 Haworthia attenuata grows and pups with abandon in the warmer months. It will throw out lots of small flowers on long stalks in the spring. Once in a while it will make seeds which I've half-heartedly attempted to grow, but with all the pups I've never tried very hard. Sometimes tiny plants will form in place of seed pods, much like the common spider plants, which seem to be clones of the parent and will grow well. Like many of the Haworthias, Haworthia attenuata roots will die back in the colder months. They can re-establish themselves in the same place, but they struggle because of all the older, dead leaves at the bottom. Haworthia attenuata leaves are tough and take a long, long time to break down. I take the opportunity of root die-back to re-pot them. I clean off the dead leaves and roots, put them in a fresh, loose and light potting mix and wait a couple of weeks to water them so any cuts can heal, as this is the only time I've lost them to rot. They are tolerant of slightly below-freezing weather...how much below freezing will depend on protection and exposure.